There are a growing number of animal-free protein products hitting the shelves today, and with them are a variety of production methods. Cellular agriculture differs from the recent wave of plant-based products like Beyond Meat’s burgers, Hampton Creek’s line of condiments and baking products, and the varieties of nut-based milks now on the market. Instead of making plant-based substitutes that try to mimic the taste and texture of meat and dairy, for example, cellular agriculture applies methods of tissue engineering to food production to make meat and dairy products that are molecularly identical to those made via conventional methods. A small number of entrepreneurs have already embraced the science and launched startups like Memphis Meats, Muufri, Clara Foods, Afineur, and Gelzen, attracting over $20 million of investment funding in 2015, a figure that’s likely to increase in 2016. Each of these startups are in the early stages of research and development; much research in cellular agriculture is required before a “post-animal bioeconomy” becomes truly viable. Because the existence of this industry is so dependent upon the advancement of research, this could take anywhere from a few years to decades. Investment in the science towards eventual commercialization of cellular agriculture is motivated by a number of factors. Removing our dependence on animals for agricultural products can significantly reduce antibiotic overuse on livestock, and provide a sustainable way to feed a population of over 9 billion by 2050. 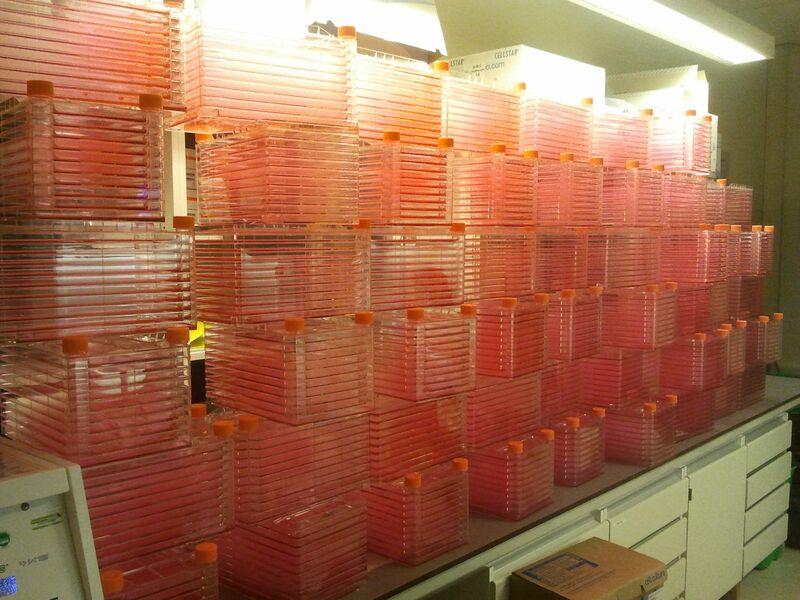 Cellular agriculture may also open the door to new, and safer, culinary possibilities. In the most literal sense of cellular agriculture, certain products like meat and leather are produced by harvesting the cells themselves in their entirety. Animal products made of living or once-living cells can be made by growing large quantities of cells in a medium for them to grow in, and then putting those cells together to make food (for example, muscle and fat cells into meat) or materials (skin cells into leather). The world’s first cultured beef hamburger made by Dr. Mark Post in 2013 served as a proof of concept for this method, using established tissue engineering methods (the science of growing organs for human medical use) to grow the cow muscle cells that formed the beef patty. Approximately one-quarter of the total flasks used to produce Mark Post’s cultured beef hamburger in 2013, each containing a small amount of the 20,000 cultured meat fibers that formed the patty. The process, however, was extremely costly at $330k, and time-consuming, taking three laboratory technicians three months to painstakingly nurture the 20,000 individual muscle fibers that made up the burger. Although consumers are expressing great interest in cultured meat, there are many obstacles which must be overcome through further scientific research if products are ever to reach the market. Currently, New Harvest is the only research institute in the world dedicating funds and effort to the advancement of cellular agriculture. Major challenges on the road to commercialization that the donor-funded organization aims to solve through its work include 1) finding a cost-effective medium for cell nutrition and 2) developing an optimized bioreactor design (the machines in which cultured meat will actually grow, once production moves from the R&D stage in labs into brewery-like industrial scales). Estimates of when cellular agriculture products can reach store shelves are difficult to make, as their availability will depend on successful research. With major advances, however, it is hoped that consumers will get to enjoy cultured meat products in the foreseeable future. Estimates of when cellular agriculture products can reach store shelves are difficult to make, as their availability will depend on successful research. With major advances, however, it is hoped that consumers will get to enjoy cultured meat products in the foreseeable future. Products like eggs, gelatin, and milk produced from cell-culture are a closer reality for consumers than their cellular counterparts. In acellular production, cells or microbes (like yeast or bacteria) are used not to form the basis of the products themselves but rather as a “factory” to produce fats and/or proteins, like eggs and milk. Unlike meat or leather, acellular agriculture products contain no cells or living material. Although acellular foods like milk and egg whites are relatively novel, acellular production of animal products has been utilized by humans for decades: in 1978, scientists discovered a way to produce human insulin through bacteria, and this method has since been used to make the vast majority of insulin today. Before this, insulin could only be collected from the pancreases of pigs or cattle. Rennet, a key ingredient in the making of cheese, has also been produced via acellular agriculture since 1990. Vanillin (the primary component of vanilla flavor) is currently being derived from yeast by a Swiss company called Evolva. U.S. startups Muufri and Clara Foods are currently in the early stages of research and development to bring their products to market, but they hope to release their products within the next few years. Fermentation is one of the oldest scientific processes to be harnessed for food production, giving us alcohol, yogurt, kimchi, kombucha, and some pickled foods. Some forms of fermentation fall under the cellular agriculture umbrella as well. 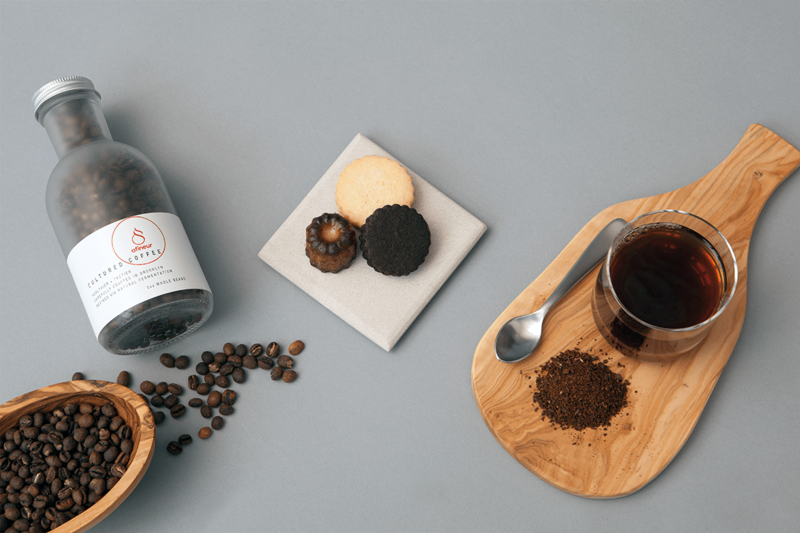 Brooklyn-based Afineur is making cultured coffee, in which the coffee beans undergo a secondary fermentation process “to precisely remove undesirable coffee flavor molecules while enriching interesting ones,” unlocking new flavors and improving digestibility. The resulting cup, the company says, is unlike anything else: extremely low in bitterness with shining fruity, floral, and chocolatey notes. At noma, the four-time winner of Restaurant magazine’s prestigious “Best Restaurant in the World” award, chef David Zilber heads the Fermentation research lab, where centuries-old techniques and microbial lineages are re-examined to coax out new flavors and foods in previously undiscovered ways. Projects at the Noma “science bunker” include reverse engineering Vegemite for the restaurant’s Australian menu; lactobacillus ferments (think sauerkraut); and making their own varieties of vinegar, fish sauces, and a mold called Koji. Cellular agriculture may also bring food safety benefits. Harvesting food products through animal farming places inherent limits on what we can do with them. Bacteria like e.coli and salmonella, which naturally coexist inside the bodies of living animals, can contaminate meat and other products. By producing foods from the bottom up, the limits associated with traditional animal products could become a thing of the past. Eggs made from cellular agriculture methods by Clara Foods may be customized for various culinary purposes, whether as isolated egg whites — for which there is a higher demand than for yolks — or for specific qualities such as fluffier cakes, or optimal foam formation for meringues, souffle, and mousses. Additionally, products like Muufri’s animal-free dairy milk will likely have longer shelf lives than their animal-derived counterparts. Zilber, Afineur’s Camille Delebecque, Mark Post, Ryan Pandya of Muufri, and Clara Foods’ Arturo Elizondo were among the leaders in cellular agriculture who spoke at our first conference on July 13 in San Francisco.